WHAT IS THIS DEVOPS THING ANYWAY? We talk a lot about empathy in DevOps. The Five Love Languages is basically about being empathetic. But we need to talk about HOW you do these things, rather than just say "MAKE WITH THE EMPATHY" WHAT DOES THIS HAVE TO DO WITH SHIPPING SOFTWARE? What does this have to do with anything? WUT? theyʼre authentically interested in them, and enjoy the pursuit of the how of change more than the change itself. THE BEST CHANGE INFLUENCERS ARE THOSE WHO DON’T SEE PEOPLE AS SOMETHING THEY ‘HAVE TO DEAL WITH’. 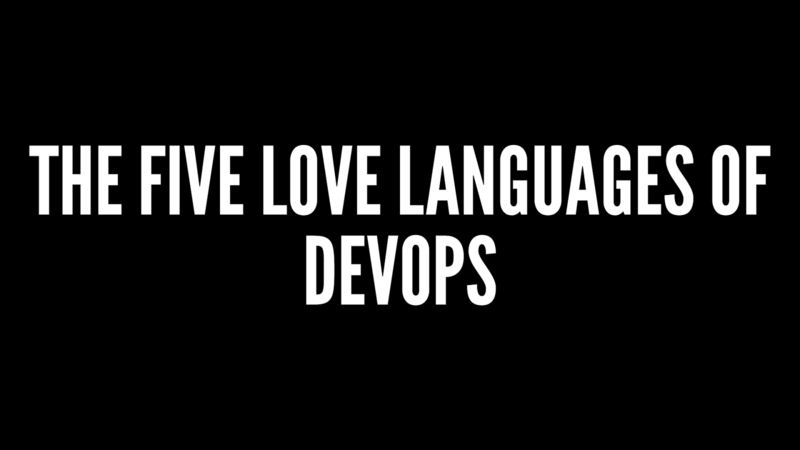 View The Five Love Languages of DevOps. The title of this session is inspired by the self-help book The Five Love Languages by Gary Chapman, but the similarities end there. When we are working to bring about cultural change in our organization, it’s essential for us to understand that not everyone speaks the same “language” of DevOps as we do. The CFO has different drivers and communication style than your friend in the QA department, who is still different than the DBA in that remote office. In this talk, I will work to help provide techniques and strategies for identifying the drivers of your peers and decision-makers. We will talk about beliefs, perceptions, and communication styles, all with the express intent of helping YOU drive home the value of the DevOps philosophies and work-practices to make your organization succeed! Content will include a discussion of the DiSC model, as well as discerning drivers for different individuals to adjust the conversation. The DiSC model provides a common language that people can use to better understand themselves and to adapt their behaviors with others. The four areas of DiSC are Dominance, Influence, Steadiness, and Conscientiousness. Approximately 25% of the talk will be background on DiSC and methods for identifying the communication styles of others. 25% will be based upon identifying drivers of example roles in an organization (finance, product, tech ops, etc), and the remaining will be focused on use cases and strategies for applying this skill towards organizational change.